In the Outskirts of Delhi. It is impossible to go anywhere in India without being confronted with the terrible enormity of hunger. One in two Indians goes to sleep at night without a full stomach. At the outskirts of Delhi, which was once farmland, shacks house those who work across the city. They are the people who build houses and clean houses, who build goods and dispose of goods. A walk down the streets of the trans-Yamuna colonies reveals that despite the new buildings there, new hovels rise up. One set is built along a wall underneath the shadow of the Metro rail. The people there tell me that they were construction workers for the Metro. That is when they moved to this encampment. The Metro is now complete. They remain. They scratch out a living as domestic workers and construction workers. It is early in the morning. Children eat bits of bread. Hunger shadows the eyes of the adults. The conversation goes to food. ‘Onions and potatoes are too expensive’, says one man. He is right. This is a reflection of rising petrol prices. That he mentioned onions and potatoes is of interest. These are luxuries here. Starch is the main food. A few months ago, I spoke to people who had queued up outside a van. This van had a poster that read, ‘Balaji Kunba–a family against hunger’. Over the course of the past year, the Bisoya has been distributing food to the poor across the city. They are motivated by great moral feeling, but not by parochial religious considerations. The figure on the poster is Hanuman, whom they say is angry not at this religion or that, but at hunger. Hanuman, they say, ‘goes to the temple to eat a ladoo. He goes to the mosque to eat kheer’. Those who are hungry, the family says, do not understand religion. The UN’s Food and Agricultural Organisation’s quarterly report shows that the countries that require food assistance increased from 37 to 39. A combination of erratic rainfall and war has removed food from the homes of people. Harvests continue to decline in regions of the world wracked by conflict, places such as Iraq, South Sudan, Syria and Yemen as well as in parts of Central Africa. ‘Conflicts have choked agricultural activity’ in these regions, the FAO points out, ‘where access to food is further hindered by surging inflation’. It is now estimated that in South Sudan, where the conflict seems endless, 7.1 million South Sudanese are hungry all day, each day. That is to say, two of every three people in South Sudan suffer from acute or crisis food insecurity. This is a direct result of the war. Matters are as bad in Yemen, where the three-year war prosecuted by Saudi Arabia and the United Arab Emirates, has starved the population. By the end of this year, eighteen million Yemenis (out of a population of twenty-two million people) will starve. It is likely that the Saudi-Emirati coalition will seize the port city of Hodeida on the Red Sea, and most likely would use its control over the port to embargo supplies into the country. Seventy per cent of Yemen’s food, fifty per cent of its fuel and most of its medicines enters from this port. The siege of the country would be truly catastrophic for the country. Not far from the hovels in Delhi sits the Gazipur landfill. It is the size of a small mountain. Delhi’s trash goes there. As the hot summer wind moves westwards, it carries the rancid smells from the landfill. Last year, garbage from that little mountain fell and killed two people. It is a hazard in so many ways. The landfill reminds us of the waste produced in our society–a fact noted by The Economics of Ecosystems and Biodiversity group . A stunning forty per cent of all food is lost or wasted. There is more than enough food produced on the planet for all the billions of its inhabitants. 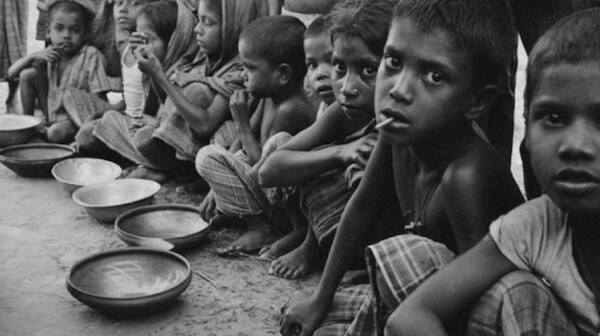 Yet, those who have no, or little, money cannot afford to feed themselves. Those without property are fated to starve. The food that cannot be bought is thrown away. The excess food that cannot be eaten by those who have the money is also thrown away. It is a rebuke to the capitalist system that people are forced to starve if they have no money and that the food that is available is thrown away because of economic inequality. That smell from the landfill sends another important message. As the food decomposes in the landfill, it produces methane. Methane is far more lethal as a greenhouse gas than carbon dioxide. One of the drivers of climate change is, therefore, the wasted food (as well as other organic matter). War, Climate Change, Money–these are the engines of hunger. The terrible atrocity of the wars in South Sudan and Yemen should sharpen our gaze at the epidemic of hunger. But there is a quiet war ongoing in places like India. Here, there are no bombs falling from the sky. Instead, there is another kind of bomb that finds itself bursting on every street, near every shack. This is an idea: the idea of private property. Those who have no private property struggle to eat. They huddle together in their shacks, not far from hotels and homes, from restaurants and markets.